Please peruse this page to learn more about NKMAA, and who Grandmaster Timmerman is. 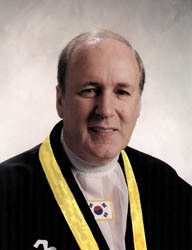 The National Korean Martial Arts Association was founded by GM Rudy W. Timmerman over four decades ago (1973), and as such it is one of the oldest martial arts associations that has faithfully served Korean style martial artists the world over. Although the association was founded back in the early 70’s, serving the World Kuk Sool Association as Director for all of Canada and Michigan, took up all his time; hence, Grandmaster Timmerman did not put his back into developing NKMAA until he left the World Kuk Sool Association in 1998. Since then, he and several of his most loyal students have worked hard to assist Korean style martial artists with seminars, testing, certification, and curriculum development. NKMAA now has members in nearly all corners of the world, and GM Timmerman travels extensively to assist them with training, testing, certification, and curriculum development. With travel becoming more expensive, and the need to share knowledge with our members becoming even more important as age creeps up on GM Timmerman, he developed a much needed Long Distance training program (LDT). The LDT program proved very successful; and, many school owners living far away have not only been able to continue their training, they have done so well enough to earn higher ranks. The main reason for our success is that NKMAA conducts its business without the politics and stifling rules many other associations dictate to their members. We do not “push” our philosophies or goods on anyone, and all we ask of our members is that they be trustworthy and ethical in their conduct. Members simply use the service or goods they need, and we stand by to assist them by providing our services only when they ask for it. Simple, inexpensive, and effective! The benefits of joining NKMAA are many, but the most important one is that we are a non-profit organization interested in only one thing… YOU! Our members are why we exist, and our sole aim is to provide the services you want in a timely and cost effective manner. As a member of NKMAA you have access to training of the highest caliber. GM Timmerman has over sixty years experience, and while he is no longer the agile young competitor he once was, the immense insight of how to teach martial artists of all ranks the fine points of what makes techniques work, and the ability to convey this in a concise manner has made him a much sought after instructor to Masters and students the world over. He’ll help you to truly understand technique, so you can perform and teach it better. Another great benefit for NKMAA members is the networking you have access to. Our Facebook Groups and the KMA Brotherhood give you access to highly respected Grandmasters of various Korean martial arts, and hands on training can be had at our annual Warrior Weekend Summer Camp, world class seminars hosted by our members (The Korean Martial Arts Festival, hosted by CM Thomas Gordon in Sunny Florida, is rated as one of the top ten in North America), and at our annual Warrior Weekend Banquet. Through NKMAA contacts, you can travel to Korea or visit NKMAA schools in many other parts of the world; and, via the KMA Brotherhood GM Timmerman co-founded, NKMAA members are welcomed at awesome events like the Hap Ki Do Summit hosted by Grandmaster Ken MacKenzie, as well as the many prestigeous events hosted by Grandmasters Michael DeAlba, Serge Baubil, and Geoff Booth, If you are looking for an active organization where you can network… NKMAA has it all! In addition to superb training, NKMAA offers testing and exquisite certification. Our members have access to meaningful certification that is respected the world over. The reason for that respect is simple… GM Timmerman will NOT issue certification unless it is well deserved. NKMAA is NOT a certificate mill where you can purchase worthless pieces of paper, and we do not accept credentials from known certificate mills. While I truly appreciate the gesture of associations sending me their certificate, with the expectation of receiving an NKMAA certificate in return… I have to decline your kind offer. The ONLY way anyone can obtain an NKMAA rank certificate is to EARN it. I do this for one reason only… to keep NKMAA certification meaningful! To join NKMAA right now, Click HERE !